After a pedestrian accident, you might think the easiest way to move forward with your life is to negotiate a settlement with the driver's insurance company on your own. However, insurance companies are typically in no hurry to settle a claim and often more worried about their profit margins than ensuring that you’re fairly compensated. To protect yourself, it's best to hire a personal injury lawyer who can advocate for your interests throughout the settlement process. In fact, there are four times when a lawyer's assistance will prove indispensable. When Do You Need An Attorney Following A Pedestrian Accident? You were hit while jaywalking. You didn't look both ways before crossing the street because you were distracted by a child, pet, or some other event. You were wearing headphones and couldn't hear what was going on around you. You were walking in the road instead of using the available sidewalk. When you are found partially at fault, you can still receive compensation for your accident-related damages. Your settlement will simply be reduced by your percentage of fault to reflect your financial responsibility for your injuries. Since there is no set formula used to determine percentage of fault in an accident, an experienced attorney can negotiate on your behalf to receive a lower percentage of fault. In many cases, a lower percentage of fault can greatly increase the size of your settlement. Traumatic brain injuries, back injuries, and neck injuries can easily create a permanent disability that requires ongoing medical care and/or limits your ability to continue working. If you've been left disabled due to a pedestrian accident, you will want an experienced attorney to locate expert witnesses who can testify on your behalf. 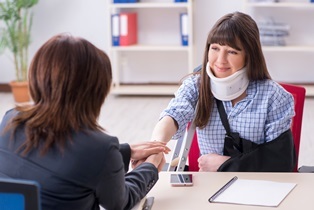 Someone with an accident-related disability is entitled to compensation for anticipated future medical expenses and/or anticipated loss of earning potential. These damages are difficult to document, since you are relying on a "best guess" of your future needs instead of submitting copies of bills or pay stubs. Anticipated expenses must be documented by testimony from approved experts who have advanced education, specialized training, and extensive experience working in a particular field. Lifecare planning experts can estimate future medical expenses given your current condition and the anticipated rate of healthcare inflation. Economic loss experts can attempt to quantify your lost earning potential by looking at your salary history, potential for future wage increases at the time of your accident, and employment trends within your industry. If you have a previous medical condition, such as chronic back pain or joint problems, receiving a fair pedestrian accident settlement will be more complicated. The driver's insurance company may try to argue that your injury is the result of a natural progression of your condition and not an effect of the accident. An experienced personal injury lawyer can locate your previous medical records and find experts to link your condition to the accident. These will allow you to be fully compensated for your injuries. It's common for a pedestrian accident to result in injuries that affect your memory of the event. If you don't accurately remember the accident, your lawyer can line up other forms of evidence to support your claim that the driver was negligent. Evidence used in a pedestrian accident case might include photos of the accident scene, copies of law enforcement reports, testimony from eyewitnesses, surveillance video from the area, or testimony from accident reconstruction experts. An experienced personal injury lawyer can work to locate this vital evidence while you direct your attention to healing from your injuries.